Though Westminster has more influence over the at the moment than the Bank of England as Parliament votes on Brexit procedures, it has not gone unnoticed that central bank governor Mark Carney has tempered his fear-mongering. Rather, he’s taking a more optimistic and constructive stance toward Britain’s looming exit from the European Union. For months, the Canadian central banker has been warning of instability, disruption and other dire consequences from Brexit. After the BoE’s policy meeting in early February, he was complaining about the “fog” of Brexit and the risk of recession. But then, a few days later, Carney sounded almost as if he’d taken a page from Prime Minister Theresa May’s vision of a post-Brexit Britain. 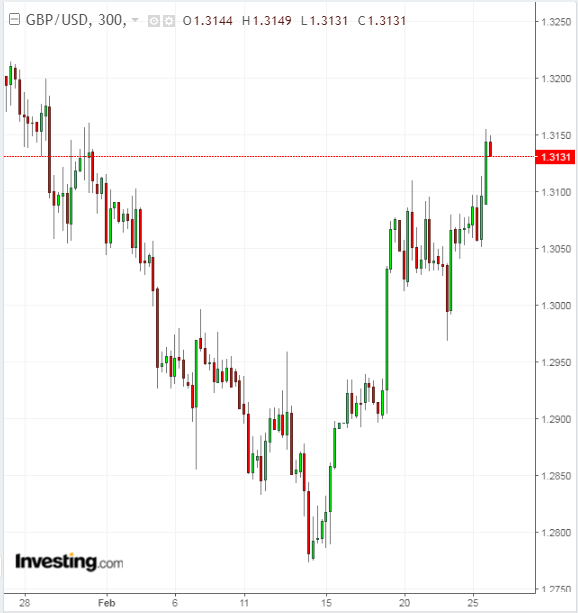 The pound reacted positively to his speech on Feb. 12, even as a no-deal Brexit grew likelier by the day. This week, Carney signed accords with U.S. regulators to keep derivatives markets open and resilient, noting that the two countries are hosts to the biggest such markets and have an obligation to maintain them for the important role they play in pensions and investments. Regulators in other European Union countries have also been scrambling to pass legislation allowing at least temporary access to London’s derivatives markets. As Britain starts the final month’s countdown to leaving the EU, the financial picture in general is clearing up—whether there is a deal or a delay or not. One thing already clear is that there has been no Brexodus, that feared mass migration of tens of thousands of jobs from London to the continent. Small wonder. London always liked to say that it had more people working in financial services than Frankfurt’s total population. And indeed, the centuries-old financial infrastructure in London simply can’t be matched and the scramble to keep derivatives trading and clearing in the U.K. drives that point home. Carney has worked hard despite his fear-mongering to minimize chances of disruption. This week’s accord with U.S. regulators may mark the turning point to his playing a consistently more constructive role. The Frobisher Hall speech put Brexit in the context of global tensions and, somewhat radically, suggested Britain might be a forerunner of how countries are responding to the negative consequences of globalization, especially the loss of democratic accountability. Carney particularly criticized barriers to free trade in services, which he said are three times higher than those for goods. Eliminating this differential, he said, would cut the U.S. deficit by one-third and the U.K. deficit by one-half. He seems less afraid of Britain facing trade issues independently and keen to portray the U.S. and U.K. as peers in a global financial system. Post-crisis financial reforms through the G20, Carney continued, shows how to “rebalance” the prescriptive supranational rules toward more differentiated, national approaches to achieve common outcomes. If you don’t hear echoes of the Leave campaign in this, you’re not listening closely enough. Brexit, in Carney’s new approach, provides a model for rebalancing the roles of local and supranational authorities. “In these respects,” Carney concluded, “Brexit could affect both short and long-term global aspects.” And he clearly means in a positive manner.